George discovered the existence of Wonder Land late last night while comparing the overheads of Cairo against where our driver had actually brought us. Some detective work and creative use of Google Earth revealed that the park we'd believed to be Sindbad Amusement Park was in fact in completely the wrong place. As the satellite images of our new location clearly showed a coaster we felt that we should at least go have a look. What we found was the Looping Star (#1327), a standard ZL42 ride, and one that ran far better than appearances might have suggested. The only slight problem was that the fully loaded train plowed through the block brake at the end of the ride at a not inconsiderable speed. A nasty collision was only just prevented by a quick thinking ride operator who grabbed the train and dragged it to a halt. It was at this point that one of the park security guards began to get agitated at three western tourists taking photographs, so we decided to go while the going was good. A brief stop in the park McDonalds fit the bill nicely ahead of the long drive to Alexandria. 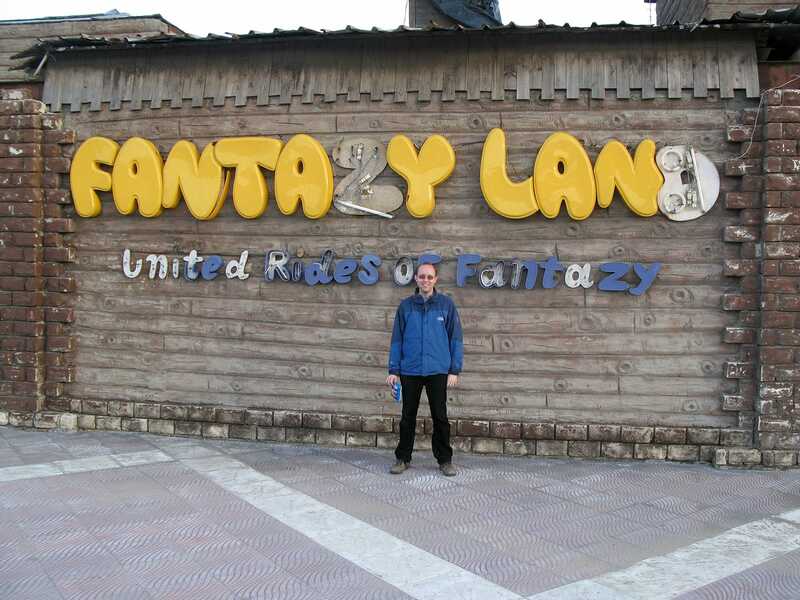 Fantazy Land made the coaster enthusiast headlines after a rather unflattering photo trip report almost three years ago. It's fair to say that I'd no real desire to visit the place personally, preferring to avoid the six hour round trip by road in favour of some more of the tourist sites in Cairo; however, I'm glad to say that I was overruled. One cannot describe Alexandria's largest amusement park as anything other than low budget; several of the letters on the sign were missing and apparently have been so since the aforementioned report was posted. However, the general appearance inside the park, while it could have used some fresh paint, nevertheless conveyed a determination to make the very best of what little money is available. It took a few minutes of discussions to get us onto the Mini Costor (#1328), as it normally carries a rule restricting it to children only. However, one of the ride operators went off to speak to someone, presumably his manager, and came back a few minutes saying there was no problem. Somewhat to our surprise he completely refused our offer of a a bashish afterwards, a true rarity in this part of the world. For purposes of comparison, the taxi driver who brought me to the airport came chasing after me when I left him to complain that his bashish wasn't big enough. Having given him fifteen percent I told him precisely where to go. We were not particularly enthused about riding anything else in the park, but we did the next best thing by buying an afternoon snack in the shop. This left us with an ideal vantage point to observe the rest of the park and thus confirm my earlier suspicion; we were indeed the only guests in the park today. It made me wonder how the place could be open at all, as our meagre contribution could not have been enough to cover the staff costs for the day.